Make this practical little homemade gift for yourself or anyone who enjoys crafting. The easel holds your current craft pattern or craft instructions upright and in place, so you can consult the directions easily. Cut seven 26″ strips of the # 40 decorative ribbon. Glue the end of one strip of ribbon to the top of the cardboard. Take the ribbon around the front of the cardboard without gluing it down, then over the end and onto the back of the cardboard again. Fold over the end of the ribbon and glue it down, overlapping the first end. Take the second strip of ribbon and glue it to the back again overlapping the first ribbon by a 1/4 of an inch. Repeat the instructions for the first ribbon strip. Repeat with the remaining five strips. Take one 8 inch by 11 inch piece of felt that matches the ribbon and glue it to the back of the cardboard so that it hides the ends of the ribbon. Take another piece of felt and glue it to the remaining back side of cardboard; trim off excess felt. Take the 3 yards of two inch ribbon, fold in half and glue one half all around the edge of the front of the cardboard. Turn the cardboard to the back and glue down the other half of the ribbon, turning in at the corners, and gluing down firmly. Make four small bows with the 1- 1/2 yards of thin ribbon. Glue one bow to each corner. Glue the four decorative buttons to the four bows and let dry. Take the ribbon covered board and stand it in a picture or plate easel. You now have a portable craft instruction easel to display your craft instructions, complete with slots to store notes or other project instructions. Just slip notes under the lengths of ribbon that are not glued down at the front of your easel. I made this craft easel because I was always dropping craft instructions from my lap – or getting a backache from bending down to read them. 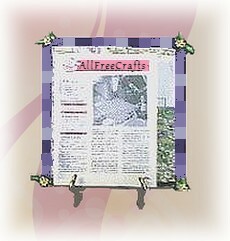 This little project solves those problems and keeps your current craft instructions organized and accessible. Enjoy!